What Team are you on??? I often hear “I want a good looking, professional web design that shows my website number one on Google. But I don’t have much money”. Yep, I often want my cake and eat it too. When it comes to budget, where do you spend your money… web design or web functionality? Imagine a website, think about how design and functionality complement each other. In today’s “I want it NOW and I’m not prepared to wait” attitude. When you click on a link you want it to load FAST “functional”. The URL (the address bar at the top of your browser) shows what page your on “functional”. When the page loads all the pretty colours and licensed (of course you didn’t just download from Google – illegally) images display “design”. These images “design” lead you to the menu bar, “functional” so you can get to where you want NOW “functional”. The entire site is divided into sections “design” and making the readability easy to read and understand “design”. Studies show that most people move on within 3 seconds if they haven’t found what they’re looking for. So, you have 3 seconds to make a good impression or lose them forever. Each page has approximately 12 seconds to meet the viewers expectations. A good design catches the eye of the viewer keeps them interested to read your attentive headlines, scan your site and find your call to action. A good design is also a reflection on your business; the personality of you, the quality of your goods and services and your work ethic. A functional website is responsible for keeping the viewer. If the website looks pretty, but takes too long to load, you’ve lost your viewer. If the website however, is easy to navigate, quick to load and the viewer can find what they’re looking for quickly and effortlessly, then they are more likely to spend time surfing your site in full and are more likely to come back more often for the full experience. Just like design, functionality is a great way to see how the business communicates and respects their clients in everyday transactions. 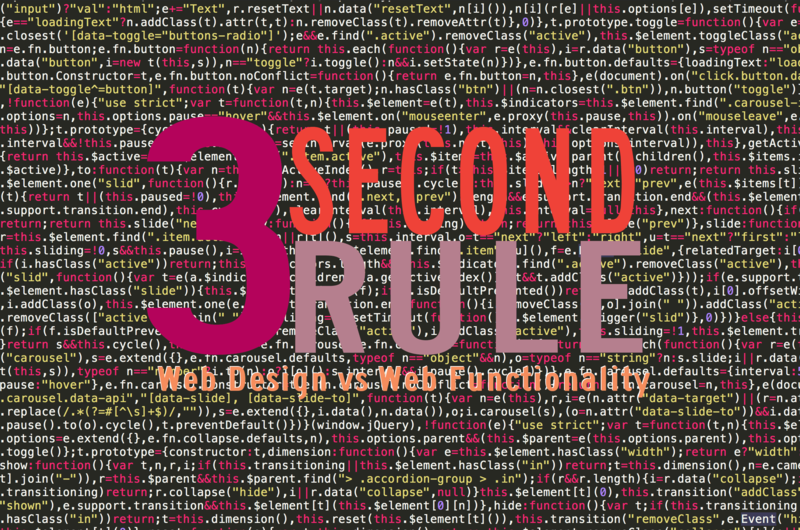 Web design and web functionality go hand in hand. If it looks appealing, it’s easy to read, easy to navigate and fast to load you will find the viewer will stay on longer, share your information and even return. AffordableWeb.Solutions work with your budget and with an experienced Graphic Designer to get the most out of your online experience. So if you want your, cake and eat it too then contact us for a no obligation proposal. Cassandra took all the stress and anxiety out of the equation, she took the time to understand my business, raising my comfort levels! Affordable Web Solutions offer, affordable, professional, web solutions to individuals and small businesses. With more than 12 years small business experience and more than 20 years in the IT space; Cassandra is excited to share her passion with out the ridiculous costs.